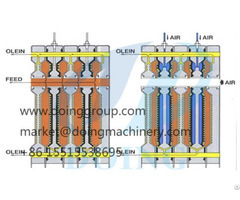 1 .Incoming oil seeds are passed over magnets to remove any trace metal before being dehuller, deskinned, or otherwise stripped of all extraneous material. In the case of cotton, the ginned seeds must be stripped of their lint as well as dehuller. In the case of corn, the kernel must undergo milling to separate the germ. 2 .The stripped seeds or nuts are then ground into coarse meal to provide more surface area to be pressed. 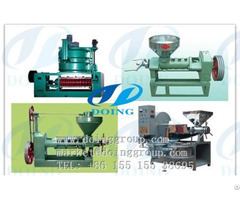 Mechanized grooved rollers or hammer mills crush the material to the proper consistency. The meal is then heated to facilitate the extraction of the oil. While the procedure allows more oil to be pressed out, more impurities are also pressed out with the oil, and these must be removed before the oil can be deemed edible. 3. The heated meal is then fed continuously into a screw press, which increases the pressure progressively as the meal passes through a slotted barrel. Pressure generally increases from 68, 950 to 20, 6850 kilopascals as the oil is squeezed out from the slots in the barrel, where it can be recovered. 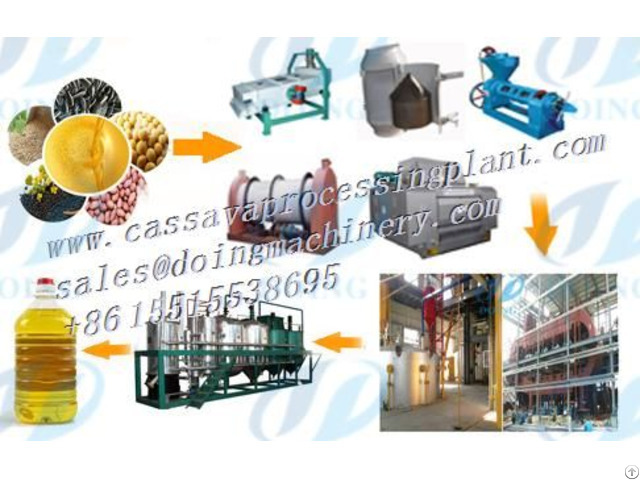 4 .Soybeans are usually not pressed at all before solvent extraction, because they have relatively little oil, but most oil seeds with more oil are pressed and solvent-treated. 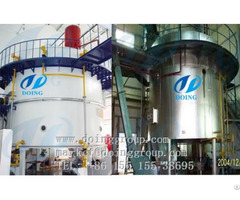 After the initial oil has been recovered from the screw press, the oil cake remaining in the press is processed by solvent extraction to attain the maximum yield. A volatile hydrocarbon (most commonly hexane) dissolves the oil out of the oil cake, which is then recoveredby distilling the light solvent out. 5 .Ninety percent of the solvent remaining in the extracted oil simply evaporates, and, as it does, it is collected for reuse. The rest is retrieved with the use of a stripping column. The oil is boiled by steam, and the lighter hexane floats upward. As it condenses, it is collected.